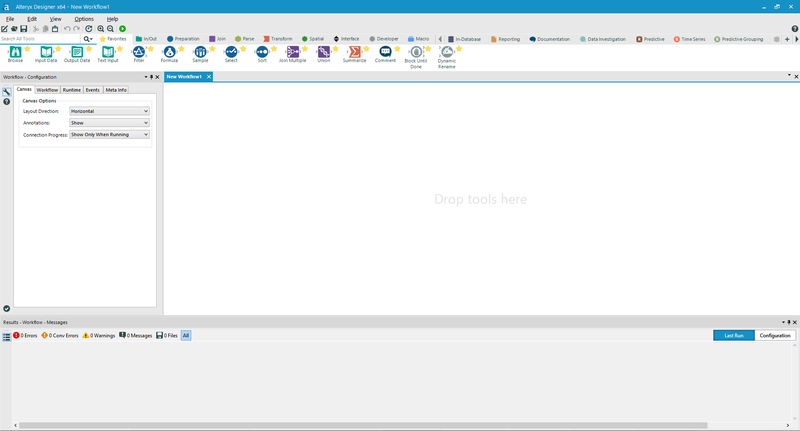 If it is the first time ever you open Alteryx, your screen will look different. Let’s see step by step what can be customised and how. The tools are divided into categories, represented by tab (Favor, In / Out, Preparation, Join, etc.) and, within each tab, they are listed in alphabetical order. Choose one of the pre-loaded presets from the drop-down menu, which are nothing but a selection of tabs / tools useful for a specific function. For example, if you deal only with data cleaning, you can choose the “Data Blending” preset and you will only have the tools useful for data blending in the bar. Manually select which categories you want to see in the bar. Manually select which specific tools you want to see in each tab. The first tab in the tool bar is called “Favorites” and it allows you to group in a single tab the tools you use more often. To add a tool to the favorites tab, just click on it and select “Add to favorites”. 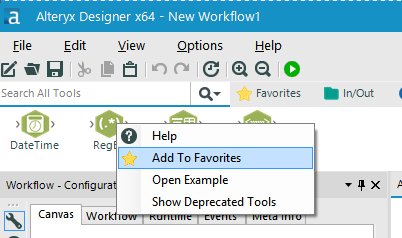 To delete a tool from the favorites tab, simply click on it and choose, this time, “Remove from favorites”. The tools and their categories are numerous. So many that if you activate them all, the screen space will not be enough to see them all. About halfway across the screen you have an arrow to the left and an arrow to the left at the bottom of the window. All the tabs on the left of the first arrow are fixed. The others can scroll. So you can act on the two arrows and scroll between the tabs. Toolbar: it is the second bar from the top, equipped with the buttons to open a new empty workflow, save, zoom (+ and -); here you can also find the “Run” key, which enables you to run the workflow. Tool Palette: it is the third bar from the top, the one with all the tabs and related tools. Overview: it is a window that shows you an overview of the whole workflow. 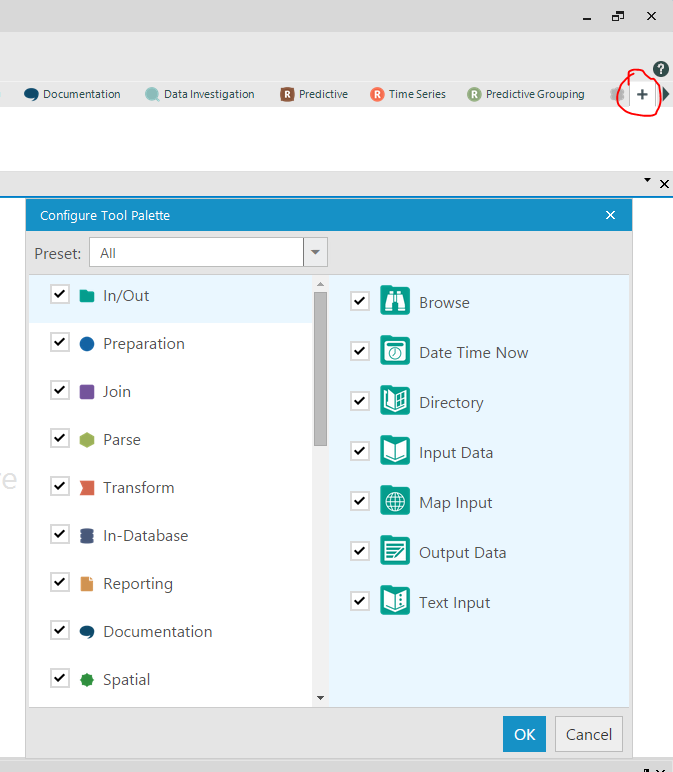 Result: this is the window in which Alteryx shows you the results of the workflow, the errors, the warning messages and the previews of the results of each single tool. Configuration: it is the window with the configuration options of each single tool or of the entire workflow. Interface Designer: it is the window you need to build the graphical interface of apps and macros. It is possible to enable or disable a window from the View menu; it is also possible to organise the work area at will. By positioning the mouse arrow (always keeping the left button pressed) on the different options of the controller, the area in which the window will end up turns blue. Once you have decided where you want to place it, just release the mouse button and the window will move there. The X will allow you to close a window, which can then be re-enabled from the View menu. The pin is used to enable the auto-hide option. The window will be compacted and made invisible, you will only see the title. You can make it visible again in two different ways: by clicking on the title or by leaving the mouse pointer for a few seconds on the title. 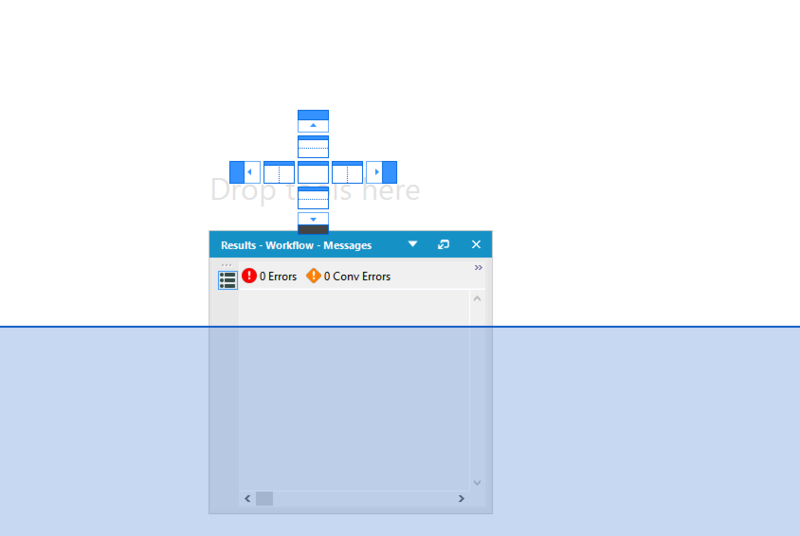 Floating: the window will not be attached to any corner, it will be “floating”, in the middle of the screen or where you prefer to place it. Dockable: is the exact opposite of floating; and is the default option for all windows. Dockable: the window will become a tab of the workspace. Once your “work of personalization” is finished, you can save the new settings. 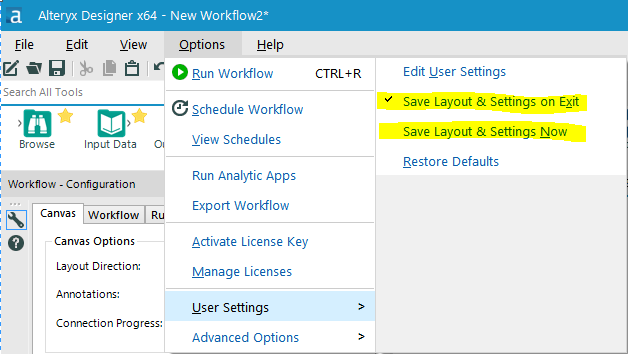 In the options → user settings menu there is a default option that allows you to save your layout. Needless to say, if the program were to crash or suffer an abnormal shutdown, all the customization work would be lost. So there is also the option to immediately save the new settings. In the same menu you also have a command to clean all the customisation you made and return to the initial aspect.